Sarria, D.; Pallares, O.; Del Rio, J.; Manuel, A. On this work a low cost OFDM transmitter for underwater sensor networks is presented. The transmitter is based on a low power microcontroller that governs a DDS in order to generate the output data -OFDM symbols- avoiding the IFFT computations. This solution represents a new design perspective for the current UWSN -mainly based on FPGAs or DSPs, allowing to reduce the cost, the power consumption and the size of the current transmitters. On this work a low cost OFDM transmitter for underwater sensor networks is presented. The transmitter is based on a low power microcontroller that governs a DDS in order to generate the output data -OFDM symbols- avoiding the IFFT computations. This solution represents a new design perspective for the current UWSN -mainly based on FPGAs or DSPs, allowing to reduce the cost, the power consumption and the size of the current transmitters. Sarria, D. [et al.]. 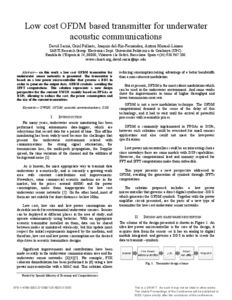 Low cost OFDM based transmitter for underwater acoustic communications. A: OCEANS MTS/IEEE. "Proceedings OCEANS'13 MTS/IEEE Bergen - The Northern dimension and Challenges". Bergen: 2013.